Home > Image Theory, Other Blogs	> 3D of the Day: Imprinted in a Contact-Only Mechanism? Bueno, Colin, es natural que haya “ojos” por todos los sitios…. As you say, Carlos, there are eyes “all over the place”, and that’s not counting the coins that will no doubt be making a reappearance shortly on this thread (though not from me, I hasten to add). As you say, Charles, no eyes “all over the place” and that’s not counting the coins certainly be making a comeback soon in this thread (though not me, I hasten to add). Why dwell on the eyes? Even the blood stains on the forehead show elevation. This 3D scan is crude and serviceable for generalities only. As for the eyes, the right eye in this image protrudes. This would be consistent with an orbital hemorrhage and proptosis and consistent with the the trauma incurred to this side of the face. This, I am an expert on. Putting those two steps together has taken more than one ‘medical expert’ over the edge of the sindonological cliff. Thank you, Stan, for your optical expertise. Is there a rhinologist among our readers who could explain how the nose in the image appears to have shrunk so completely into the cheeks so as not to protrude in any way from the upper plane of the face? While waiting for your rhinologist Hugh, you might be interested to hear the suggestion I flagged up yesterday on my own site. The angular nature of the face has always been cited as the chief objection to imprinting by contact, at least in a medieval Garlaschelli-style model involving manual moulding, e.g. with his powder frottage. It’s the nose especially that is the problem, giving rise to distortion and other anomalies dependng on whether the cloth follows the contours whether it bridges, leaving gaps. Here’s my solution, in the new flour-powder imprinting model. The powder was applied to all parts of the face except the nose. When wet linen was draped over, pressure was applied to the nose (ouch) to flatten it, (more correctly, to deform it by pushing skin and cartilage to one side – left or right). Thus reduced to a little more than a shallow bony step there is, one need hardly add, the corresponding gap in the imprinted image. Remedy? The “nose” was then added, using flour essentially like paint (but they didn’t make a terribly good job of it, did they, the nose and surrounding area looking a total disaster area, at least in the 3D rendering above?). Obtaining those eyes requires that two things be done as regards LIGHTING, the oh so crucial lighting in ImageJ. All will be explained in today’s Topic 4. Preliminary results with the microscopy will be Topic 5 later today – a very tricky area , but one that has provided additional clues as to how the image may have been developed in TWO stages – first with a flat iron to fix the flour and see an initial faint image (allowing for more doctoring if needed) then followed by oven roasting to bring up the full (Maillard?) colour, followed finally by image attentuation, e.g. soap and water. One can tentatively identify all these stages under the microscope in the model system. Matching the end stage with the TS, the latter a centuries- old image, will be the real challenge, but things look promising as regards seeing single/isolated fibre coloration – a remarkable phenomenon – though maybe not the so-called half-tone effect. This one is funny. Could you include it in your final version or is it another ephemeral hypothesis? What is it? The flour absorbed the nose to such an extent that nose was left? If there’s one thing that one sees time and again with the trolling tendency, it’s an inability to cope with new ideas, and a deep and scarcely rational resentment towards those who propose new ideas, whether good, bad or indifferent. Solution? Here’s some well-intentioned advice. Don’t be content with dipping a toe in the water. Take the plunge. Come on in, the water’s luverly. Let’s be hearing YOUR ideas – good, bad or indifferent. As regards the nose being doctored, it’s actually a development of Luigi Garlaschelli’s ideas. He gave up on the face, saying a bas relief must have been used, it not apparently occurring to him that the nose is pliable and can thus be ‘pushed to one side’, But look what he had to say about the fingers. He suggested that they were ‘painted’ by hand rather than imprinted (difficult in his dry linen model) and not, he added, terribly well done – explaining perhaps the unnaturally spindly look. One wonders if the hair too might also have been done separately from the rest of the face, e.g. with a woodblock or similar, which is not unlikely, given the way it frames the face with a gap between the two, more obvious at the two sides. Garlaschelli’s hypothesis uses necessarily the red ocher ….. does he think to add it to the flour in some moment? La hipótesis de Garlaschelli utiliza necesariamente el ocre rojo…..¿piensa añadirlo a la harina en algún momento? Is nobody interested (sob, sob) in how those “eyes” were generated In Image 3D? You may need to rotate your laptop screen through 90 degrees. Conozco bien algunos aspectos de la incidencia de la luz y de la angulación sobre la imagen de la Sábana. Si usted tiene un ordenador portátil que sea “antiguo” podrá observar un fenómeno muy curioso, la transición paulatina de la imagen positiva a la imagen negativa cuando va desplazando (angulando) la pantalla del ordenador hasta la HORIZONTAL. O bien con una “pantalla antigua” de un ordenador de sobremesa, desplazando la pantalla hacia la HORIZONTAL o bien girándola paulatinamente en la VERTICALIDAD. La imagen de la Sábana debe ser en COLOR. Es un ESPECTÁCULO ver como el positivo del rostro se va transformando en negativo….y hay detalles que se hacen más patentes. Las intensidades de los tonos se van modificando gradualmente hasta invertirse, “como si” se cortara la imagen por planos de intensidades…..
En las pantallas “modernas” el funcionamiento es distinto y la imagen no ( negación) se altera con las angulaciones. There’s maybe been a misunderstanding there Carlos.Yes, I knew that certain screen tilts can produce those weird changes in the image (there’s a guy with his own site who thinks the new info is real!). As an alternative to rotating the screen, simply turn your head through 90 degrees instead to see what happens to that image on the right. It’s not a screen artefact. It’s the result of turning an image from horizontal to vertical in ImageJ so as to obtain a different pattern of light and shade. It’s the shadowing that creates the 3D effect when using the default non-zero z scale setting. Here’s a graphic from my site where the screen or head-turning has been done for you as the lighting control is increased. Observe the way that empty eye sockets acquire eyes when it’s overhead instead of the side illumination from the left (the latter being ImageJ’s default setting which introduces arbitrary bias and selection needless to say). 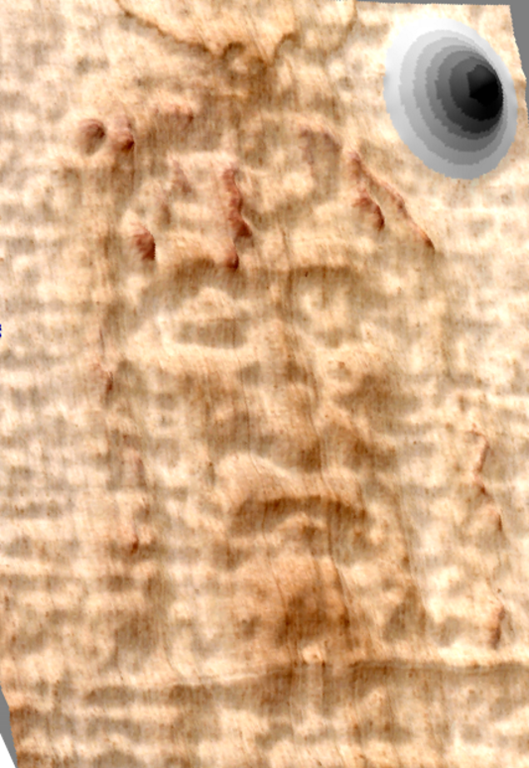 Moral: always rotate the image in ImageJ to reveal detail that might otherwise be missed, even if it’s artefactual detail!. Another St. Louis Shroud of Turin Conference in 2018? From out of the strong came forth the sweet?